Lauris Technologies Inc. (“LaurisTech”) announces addition of the molecular weight / mass flow measurement capability to the FC1223 ultrasonic gas flow meter. The meter is built on proprietary transit-phase method which allows reliable volume flow measurement of highly turbulent gas flows. The reliability of the method follows from its fundamental insensitivity to speed of sound in the moving fluid. This advantage, consequently, turns into a challenge for determining the molecular weight / mass flow of the FC-type meters. LaurisTech overcame this challenge by developing a new molecular weight / mass flow measurement technique in which the meter uses gas velocity to provide high accuracy mass flow measurement, within a few percent. Mass flow meters are used to determine the process mass balance in a large number of gas flaring facilities. It is an important parameter in flare gas flow measurement and, as such, it has been provided by other manufacturers of ultrasonic flare gas flow meters. Alternatively, mass flow of flare gas can be measured by thermal mass flow meters. However, this type of flow measurement is not suitable for flare gas metering because the output of thermal mass meter is governed by the gas velocity and the composition of gas. The known gas composition actually removes the need for mass flow measurement as the density can be calculated from the chemical composition of the gas at the operating pressure. 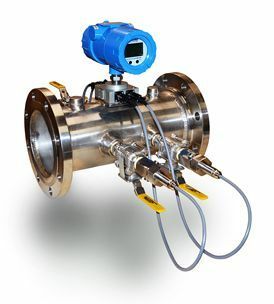 In addition, Coriolis flow meters provide direct measurement of mass flow independent of gas composition. Flow obstruction, limited pipe size, and cost make them impractical for flare gas measurement. The mass flow measurement capability will be offered as a standard feature in LaurisTech’ ultrasonic gas flow meters, model FC1223-M.